USS Arizona survivors from left, John Anderson, Don Stratton, Louis Conter and Lauren Bruner arrive Tues. Dec. 2, 2014 in Pearl Harbor, Hawaii. 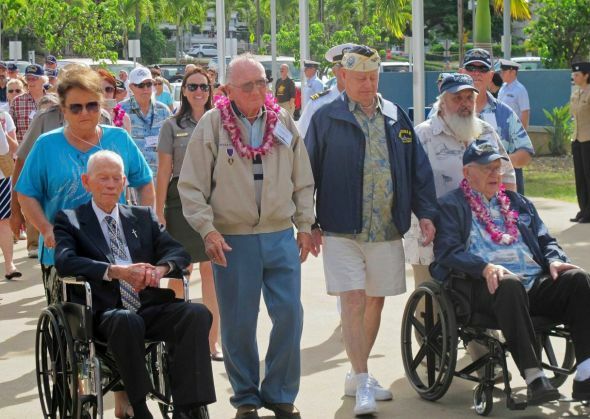 They are four of the remaining nine USS Arizona survivors of the Pearl Harbor attack. Sunday marks the 73rd anniversary of the Japanese attack that killed roughly 2,400 sailors, Marines and soldiers. (by Jennifer Sinco Kelleher, AP at the San Francisco Chronicle) PEARL HARBOR, Hawaii (AP) — Four of the remaining nine USS Arizona survivors of the Pearl Harbor attack are vowing this year’s anniversary won’t be their last reunion. The men in their 90s gathered for a news conference Tuesday in a building overlooking the memorial that sits on top of the Arizona, a battleship that sank in the Dec. 7, 1941 attack. 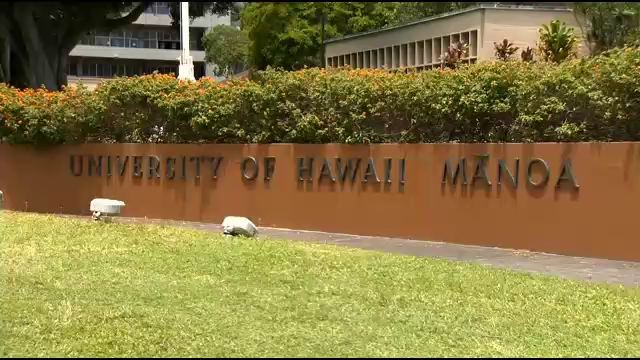 Even though it’s the last official survivor gathering of the USS Arizona Reunion Association, the men said they still plan to get together, even if not in Hawaii. Donald Stratton, 92, of Colorado Springs, Colorado, was one of the few survivors of a gun director in the forward part of the ship. More than 65 percent of his body was burned. Stratton was hospitalized for more than year and then was medically discharged from the Navy. He then reenlisted a year later. “The good Lord saved just a few of us,” he said. 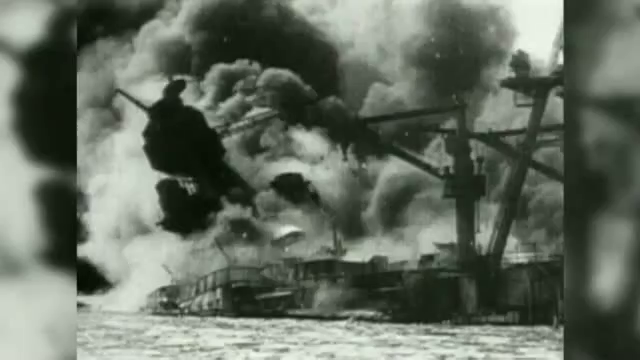 Sunday marks the 73rd anniversary of the Japanese attack that killed about 2,400 sailors, Marines and soldiers. During a private event Sunday, the four men will toast their shipmates, drinking from replicas of champagne glasses from the Arizona. They will share a bottle of sparkling wine that was a gift to the survivors association from President Gerald Ford’s visit to Spain in 1975. Arial view of the USS Arizona Memorial, located at Pearl Harbor in Honolulu, Hawaii. 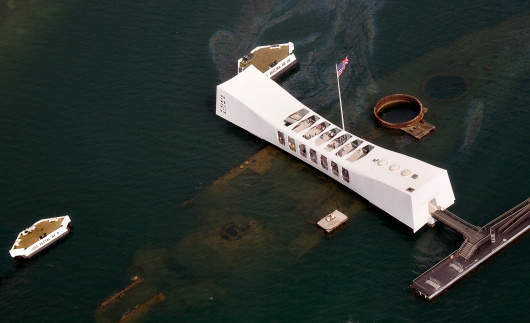 It marks the resting place of 1,102 of the 1,177 sailors and marines killed on the USS Arizona (BB-39) during the Japanese surprise attack on Pearl Harbor on 7 December 1941 and commemorates the events of that day. The attack on Pearl Harbor and the island of Oʻahu was the action that led to the United States’ direct involvement in World War II. The memorial, built in 1962, is visited by more than one million people annually. Accessible only by boat, it straddles the sunken hull of the battleship without touching it. Historical information about the attack, shuttle boats to and from the memorial, and general visitor services are available at the associated USS Arizona Memorial Visitor Center, which opened in 1980 and is operated by the National Park Service. The sunken remains of the battleship were declared a National Historic Landmark on 5 May 1989. The men arrived at the Pearl Harbor visitor center on Tuesday to military salutes, music from the U.S. Navy Pacific Fleet Band and photos from tourists. At the news conference, they reminisced about memories of the attack. “I learned something about faith,” said John Anderson, 97, of Roswell, New Mexico, recalling that he had just gone to church services and was heading to breakfast when someone said they saw the planes coming. He became teary-eyed as he discussed his twin brother dying in the attack. “It’s always like yesterday when we’re out here,” Conter said. The survivors on Tuesday also watched a live-feed of a dive along the Arizona’s sunken hull, which still holds the bodies of more than 900 of about 1,177 men who died on the battleship. Ashes of 38 survivors are interred there. National Park Service Historian Daniel Martinez, moderating Tuesday’s discussion, seemed overcome with emotion when he announced that Arizona survivor Lauren Bruner, 94, of La Mirada, California, last year signed paperwork for his intentions to be interred there. Conter plans to do the same, he said. From an Associated Press report at the San Francisco Chronicle. Reprinted here for educational purposes only. May not be reproduced on other websites without permission from the San Francisco Chronicle. Visit the website at sfchronicle .com. 1. a) List the names, ages and hometowns of the four Pearl Harbor survivors who are attending this years commemoration in Hawaii. b) On what battleship were these sailors serving when the Japanese attacked? 2. When did the Japanese attack Pearl Harbor? 3. Approximately how many U.S. servicemen were killed in Pearl Harbor? 4. This year marks the last official survivor gathering of the USS Arizona Reunion Association. What plans do the men have for future reunions? a) What two adjectives/characteristics do you think best describe these men? Explain your answer. b) Why is it important for all Americans to know about Pearl Harbor and read the stories of what happened on that day? The following day (December 8) the United States declared war on Japan. USS Arizona (Kidd’s flagship): hit by four armor-piercing bombs, exploded; total loss. 1,177 dead. USS Oklahoma: hit by five torpedoes, capsized; total loss. 429 dead. Refloated November 1943; capsized and lost while under tow to the mainland May 1947. USS West Virginia: hit by two bombs, seven torpedoes, sunk; returned to service July 1944. 106 dead. USS California: hit by two bombs, two torpedoes, sunk; returned to service January 1944. 100 dead. USS Nevada: hit by six bombs, one torpedo, beached; returned to service October 1942. 60 dead. USS Tennessee: hit by two bombs; returned to service February 1942. 5 dead. USS Maryland: hit by two bombs; returned to service February 1942. 4 dead (including floatplane pilot shot down). USS Pennsylvania (Kimmel’s flagship): in drydock with Cassin and Downes, hit by one bomb, debris from USS Cassin; remained in service. 9 dead.